Alfalfa winter kill in Beresford, South Dakota. Second year of establishment. As we move forward to a late spring, temperatures are warming up and alfalfa producers are having questions on how to access their alfalfa fields for winter injury. It is important to remember that an alfalfa stand evaluation and winter injury assessment needs to be done by performing two main things: (1) stand counts; and (2) check the root system. 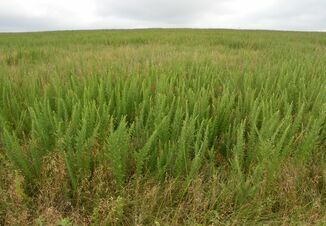 To determine if there will be a need for rotation, evaluate new shoots in plant stands on one square foot every 5 acres (other recommendations ranges from 5-10 acres). A count of total stems per square foot can provide useful information since healthy plants tend to produce more stems per shoots and this will help compensate for any potential yield loss. MAKE SURE to evaluate when there is at least 4 inches of plant growth and TAKE in CONSIDERATION random sites or locations to get the most accurate picture. Dig up the plants in a one foot square area within 5 acres and examine the plant crown and roots. The inside of the root should be a creamy-white color. If the root color tends to be more yellow or even brown the tissue is damaged. Keep in mind that the most productive stands will have at least 55 stems per square foot (Undersander et al. 2011). Some possible yield loss will be found for stem counts that have 40-55 stems per square foot. 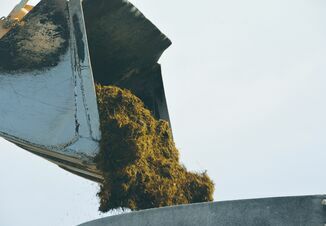 If there is less than 40 stems per square foot there is the recommendation to replace the stand, since considerable yield losses and lower forage quality will happen. What to do with injured stands? This will help those weak plants acquire and absorb more carbohydrates into their root system for future production. It is important to check the crown area for new regrowth and total biomass production. Nitrogen (N) is usually not a problem with alfalfa since it is a legume and it fixes its own nitrogen; however Potassium (K) is a critical nutrient that oftentimes will limit production. When to keep or not your alfalfa stand? The decision should be based on the total area lost. 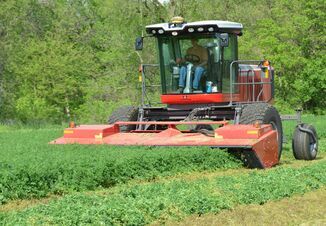 Typically, when fields have more than 50% alfalfa loss, replacing the stands may be the best solution; whereas fields with less than 50% alfalfa loss may be worth salvaging for the year of production.